The polling for seven-phased Lok Sabha elections will begin on April 11 and conclude on May 19. The counting of votes will take place on May 23. 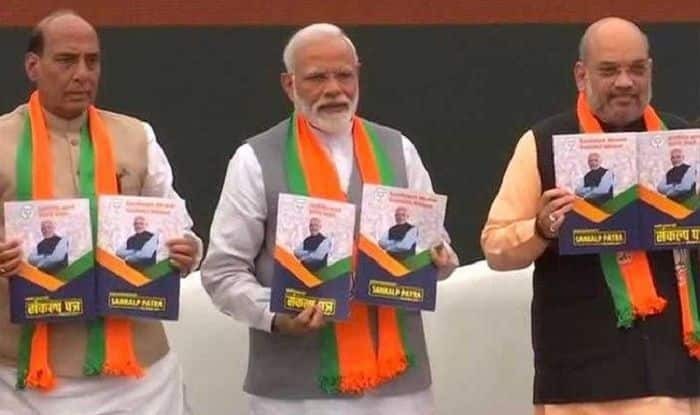 New Delhi: Prime Minister Narendra Modi, BJP chief Amit Shah released 45-page manifesto titled “Sankalp Patra” for the Lok Sabha elections 2019 on Monday. Drafted on the theme of a ‘Sankalpit Bharat – Shashakt Bharat’ (determined India, empowered India), the ruling party’s ‘Sankalp Patra‘ makes 75 promises to woo different sections of the society, particularly farmers, youth and women, besides the oppressed. “BJP manifesto was prepared after consulting 6 crore people. We are going forward with 75 resolutions that we can fulfil by the year 2022 when India completes 75 years of independence,” said BJP chief Amit Shah at the manifesto launch. In its manifesto, the ruling party promised housing for all by 2020 and the doubling of farmers’ income by next year. Besides the party also pledged to implement Uniform Civil Code and construction of ‘Ram Mandir’ at dispute site in Ayodhya ‘within the framework of the Constitution’. “BJP is committed on implementation of Uniform Civil Code. We will ensure passage of Citizenship Amendment Bill in Parliament with utmost respect to every state’s cultural value. As far as Ram Mandir is concerned, we reiterate the promise made in the last elections. We will weigh all our option and we will try that the Ram Mandir be built as soon as possible in a harmonious environment,” said Rajnath Singh. Besides, Modi government’s promise to provide Rs 6,000 yearly income support to farmers and pension to small and marginal farmers above 60 years of age under Kisan Samman Nidhi also found place in the party’s manifesto. “For all the farmers in the country, we will implement PM Kisan Samman Nidhi Yojana. We’d ensure pension for small and marginal farmers after 60 years of age,” said the Union Home Minister. The ruling party’s manifesto also included ‘zero-tolerance’ policy on terrorism., doubling farmers’ income, job opportunities for youth, women empowerment. The BJP manifesto also promised abrogation of Article 370 and annulling Article 35A of the Constitution of India. “We reiterate our position since the time of the Jan Sangh to the abrogation of Article 370. We are committed to annulling Article 35A of the Constitution of India as the provision is discriminatory against non-permanent residents and women of Jammu and Kashmir,” BJP’s ‘Sankalp Patra’ said.